I have just finished reading Robicelli’s: A Love Story, with Cupcakes, cover to cover. The book is laugh out loud funny and the cupcakes are insanely good. This is one of the only cookbooks I have read lately that I absolutely could not put down. Most of the time you look through a cookbook and mark some recipes you would like to make. I plan on making all of the 50 cupcakes in this book (I have chicken marinating in buttermilk in the fridge right now for the Chicken n’ Waffles cupcake, yes I know, sounds crazy!) The Robicelli’s will change your mind about what a cupcake should be. Go buy this book! To provide a complete review of the book, I have only one criticism. All the recipes were converted from weights to volume measurements to make things easier for home cooks. I really wish the weights were listed as well. It is actually easier and more accurate to measure ingredients by weight and makes halving or doubling recipes way easier. But as far as complexity of the recipes and ingredients, everything in the book is reasonable. You will not be missing many of these ingredients if you already have a pantry stocked for Bubbly Kitchen recipes. 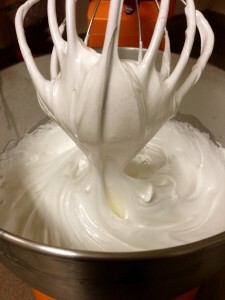 I did not use the xantham gum for my buttercream, but when the eastern NC summer heat hits, I will probably start adding the xantham for stability. Every frosting recipe in the book is based on the oh so exquisite French Buttercream. This recipe is life changing. I will admit the recipe does require a lot more work than most frostings. It will seem very time consuming to add in 1 1/2 pounds of butter piece by piece. 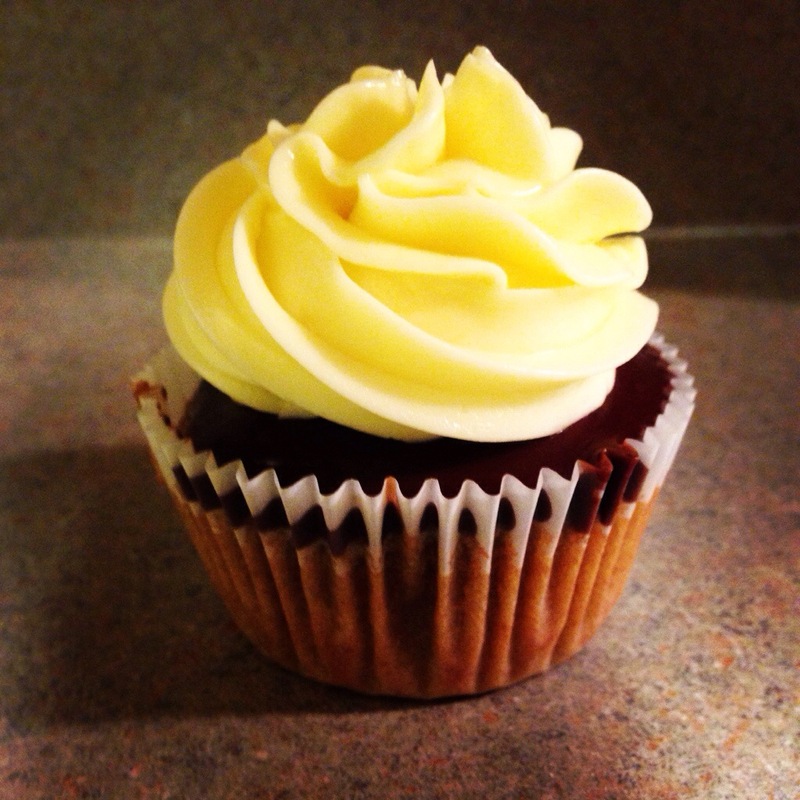 But this buttercream is well worth it. The book suggests that this recipe would frost 24 cupcakes but it actually produced enough frosting for 36 cupcakes for me. I ended up freezing the leftover buttercream. 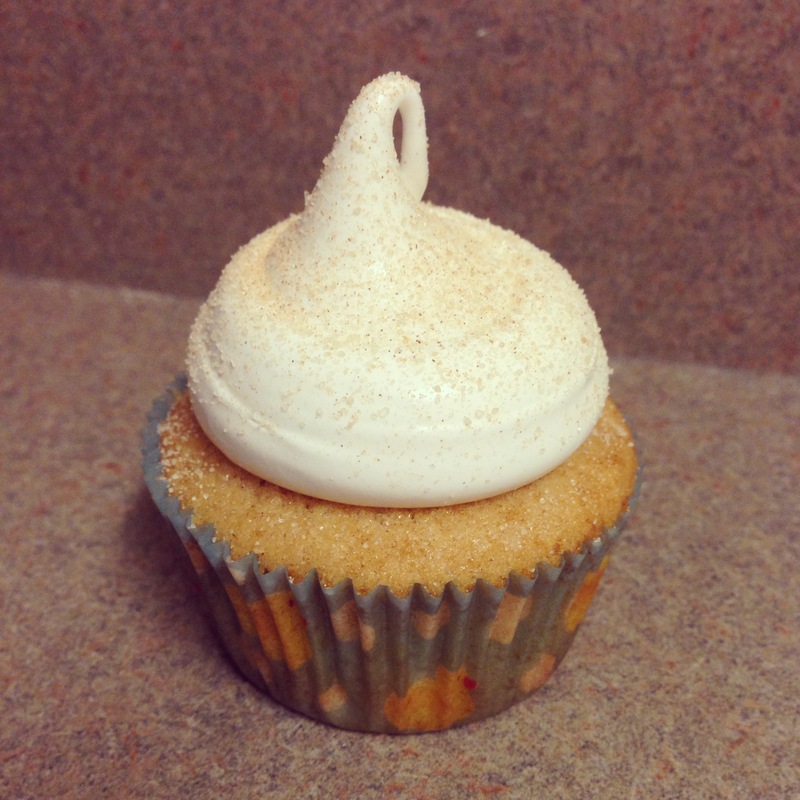 I thawed this at room temperature, whipped it up in the mixer, and it was just as fabulous. This really freezes so well. If you have one of the larger kitchenaid mixers, do not hesitate to double this recipe. In a heavy saucepan, combine the water, sugar, corn syrup, cream of tartar. 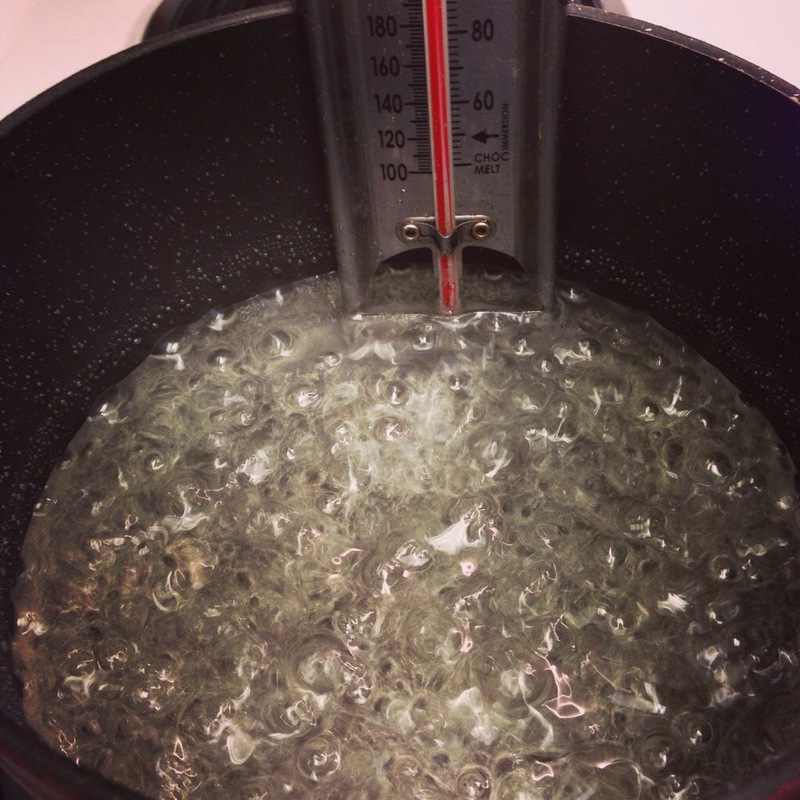 Cook this over high heat with a candy thermometer in place. You will cook your sugar to 235 degrees. While this is cooking (it takes some time) place the egg yolks and egg in the bowl of your stand mixer fitted with the whisk attachment. Mix the eggs on high, leave them alone while you keep a close eye on your sugar. You cannot over-mix the eggs. After all the sugar has been incorporated, turn the mixer up to high speed. Beat the mixture until it is cool to the touch. Change to the paddle attachment (This is important!). 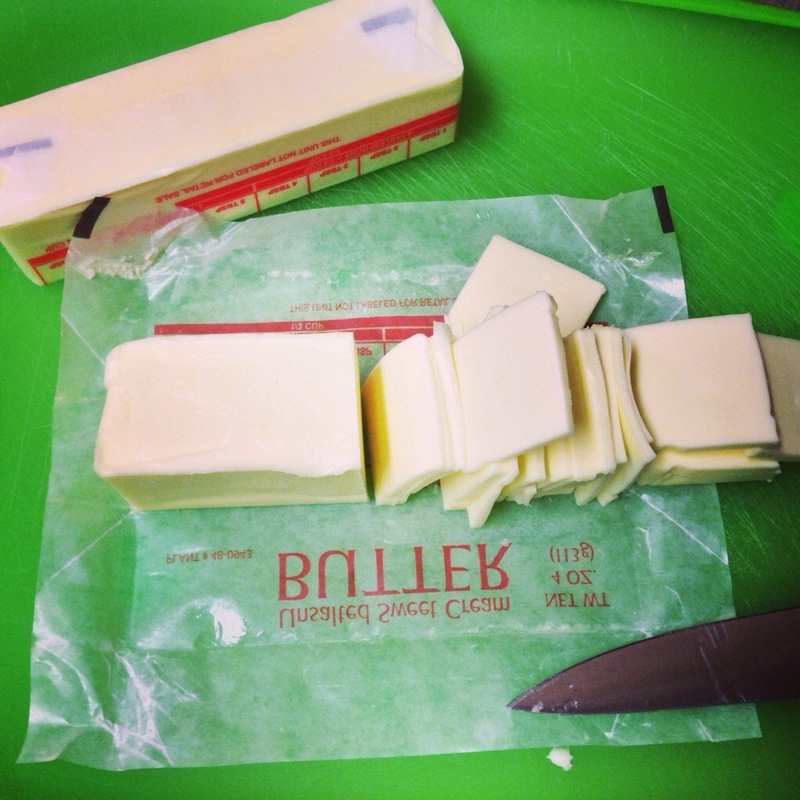 Add the cold butter by slicing off thin pieces, adding each piece one at a time. This recipe is guaranteed to get you in the holiday spirit. I originally made this for chocolate cupcakes, but this recipe is so good it really needs to be detailed alone. This is a fluffy and buttery frosting that tastes distinctly like eggnog. Be careful when you make it, don’t let your husband eat half causing you to run out of frosting for your cupcakes. 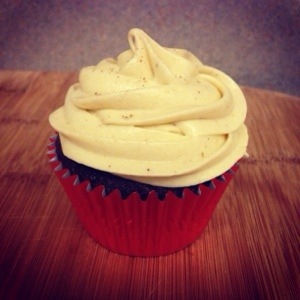 This frosting will pair well with a variety of cakes… Chocolate, cinnamon, vanilla. Yes it sounds weird to mix egg yolks into your frosting, just do it. I actually made a version of this in my food processor to really grind up the egg yolks. I did not see a difference between the food processor version and the hand mixer version. You should use just enough powdered sugar to make your frosting hold its shape for piping. Crush up hard boiled egg yolks thoroughly with a fork. Using a hand mixer, beat in the butter until light and fluffy. Beat in the rest of your ingredients up to the powdered sugar. Mix in the powdered sugar one cup at a time until you have a smooth but slightly stiff frosting that holds its shape for piping. This vanilla buttercream frosting is my husband’s absolute favorite recipe. That is really saying something considering all the bowls, beaters, spoons, and spatulas he has to taste before washing them. 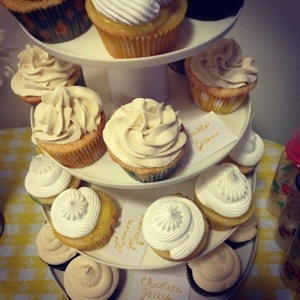 One day I made three different cupcakes with three different frostings for a party (see cupcake party display below). 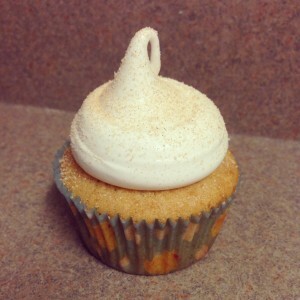 He swore up and down that this was the best one (I preferred the salted caramel frosting). This recipe was inspired by the Nielsen-Massey Madagascar Bourbon Vanilla Bean Paste that I accidentally primed and has become a pantry staple. 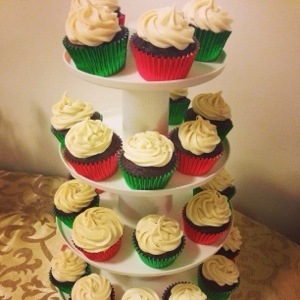 The cupcakes are extremely moist and can be whipped up in 30 minutes. I also love to have a base recipe that makes 12 cupcakes. It is easy to double recipes but usually not so easy to half recipes. Preheat oven to 350 degrees. Prepare a muffin pan with paper liners. Combine together flours, baking powder, sugar and salt in the bowl of a stand mixer. Add in the butter, sour cream, eggs, egg yolks, and vanilla. Beat on medium speed to combine, for approximately 30 seconds. (Do not over-mix!) Finish incorporating the flour with a spatula. Divide among the prepared liners, filling approximately 2/3 full. Bake for 20-22 minutes, rotating once halfway through. Allow the cupcakes to cool in the pan for 5 minutes then place them on cooling racks. Cupcake recipe adapted from Brown Eyed Baker. Vanilla Buttercream Frosting is a Bubbly Kitchen original recipe. Unfortunately, my husband is not a fan of lemon or lime desserts. I’m pretty sure it’s the only thing he has ever said he doesn’t like so I am giving him a pass. But when I asked people at work what kind of cupcakes they wanted me to bring in, I was ecstatic. 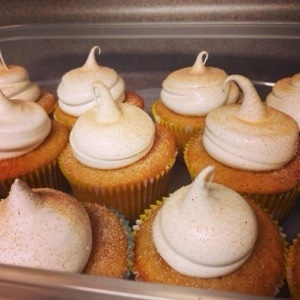 They requested lemon merengue. And let’s just say, he ate one of these cupcakes and did not complain. 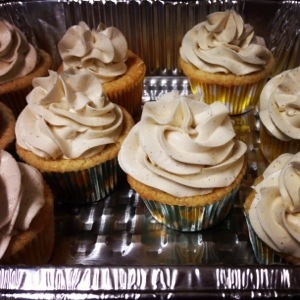 I was inspired by a Martha Stewart recipe that uses seven minute frosting as the merengue. This frosting is a delicious throwback inspired by my grandmother’s recipe. Make your lemon curd first. It is the most intensive part of this recipe but it is fabulous. Lemon curd also makes extravagant thumbprint cookies during the holdiays (recipe coming soon). The recipe for lemon curd here makes more than what you need. Which is great because it is so delicious! I recommend spreading this on scones, waffles, pancakes or toast. It should keep in the fridge for one week. 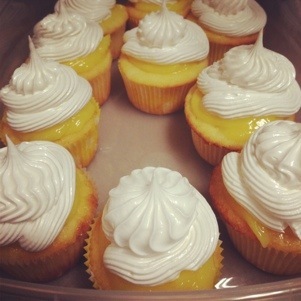 These cupcakes will need to be refrigerated until you are ready to serve them. Serve these with Gruet Blanc de Noirs from New Mexico. This is a well balanced, tart sparkling wine with yeasty notes that pair fabulously with any cake based dessert. Gruet is the American atelier of a French champagne house, Gruet et Fils. Preheat oven to 350 degrees. Prepare your muffin pan with liners. Whisk together flour, baking powder, and salt. 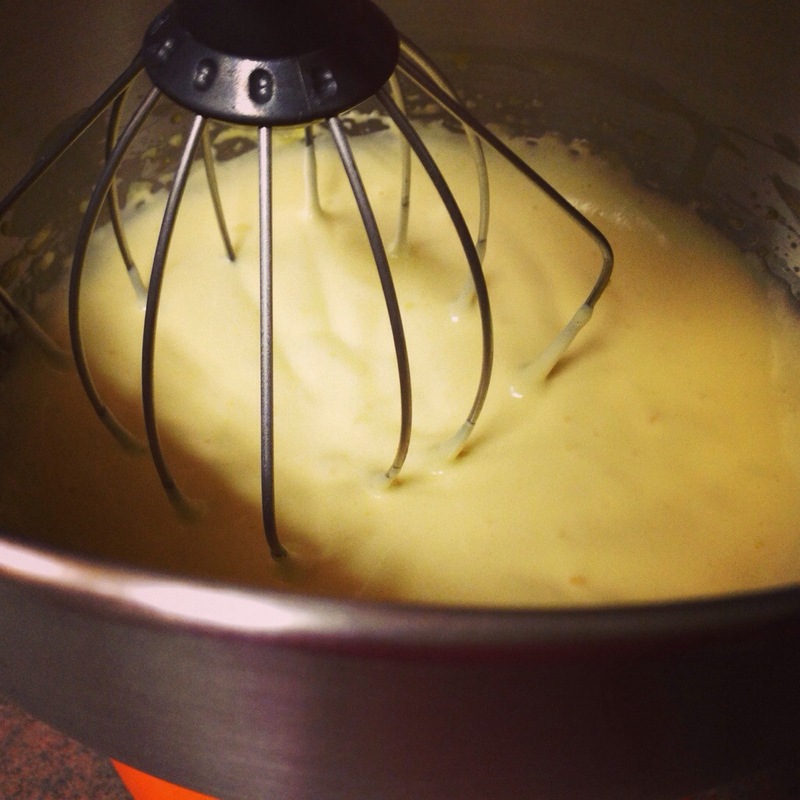 Beat the butter and sugar in the bowl of a stand mixer, on medium high, until pale and fluffy. Add each egg, beating until well incorporated. Scrape down the bowel, beat in the zest and vanilla. Add flour mixture in three additions, alternate eighth the buttermilk and lemon juice. Beat until just combined. Do not over mix. Fill each muffin cup approximately 3/4 full (I used the 4 tbsp scoop). Bake for 25 minutes, rotating the pan halfway through. Cool the cupcakes in the pan in a wire rack. Can be stored in airtight container overnight. 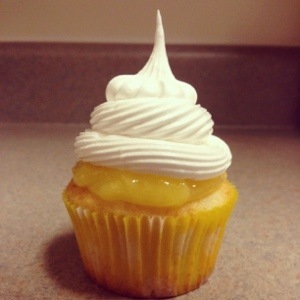 When ready to serve, spread 1 tbsp lemon curd on each cupcake. Frost with seven minute icing. I used Wilton #4B. 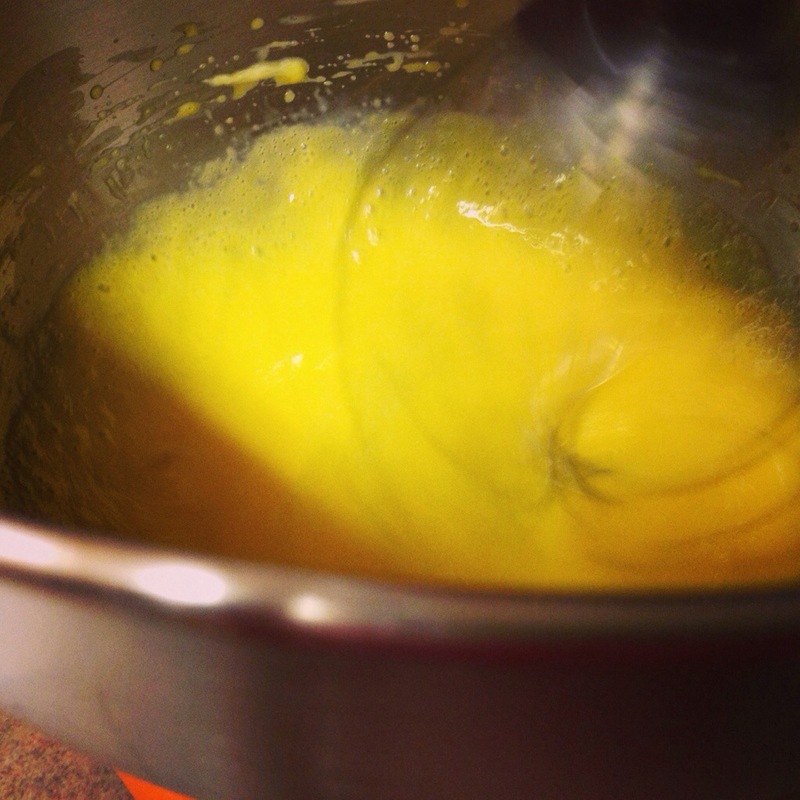 Whisk together the yolks, zest, juice, and sugar in a saucepan over medium-high heat. Cook, stirring almost constantly, for 10 minutes until the mixture is 160 degrees. Turn off the heat and stir in the salt and butter. Strain through a fine mesh sieve. Press a piece of plastic wrap directly on to the surface. Refrigerate for two hours, preferably overnight. Bring one inch of water in a medium sauce pan to a boil. Place sugar, water, corn syrup, and egg whites in the bowl of a stand mixer. Set the bowel over the saucepan of boiling water and cook until a thermometer reads 160 degrees, about 5 minutes. Transfer to the stand mixer and beat for 7 minutes, on high speed, until stiff peaks form. Beat in the vanilla.